It’s hard to believe that my first summer term will be over in just a couple weeks. I knew two summer classes would be a lot to juggle when I registered, but I was quite prepared for how busy the end of May and early June have been. The great thing about summer class, though, is that it flies by, and I’ve had enough downtime to get done what needs doing outside of class. Not quite as much time to play in the kitchen as I’d like (I miss baking! ), but I’m taking care of meal prep and fueling well. 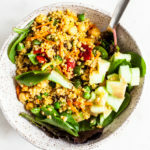 This simple quinoa and chickpea dish has been a staple for me. In two weeks I’ve made it three times, which means it’s a keeper. 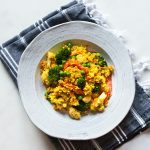 It’s nearly as easy as preparing a plain batch of quinoa, but the paprika and tomato flavors give it character and make it adaptable for many different meals. I’ve used it in bowls, in packed lunches, and piled into soft tacos. I’ve mixed it with a frozen vegetable medley and a killer sauce (most often my cashew queso) and called it dinner; I’ve also used it as a side dish, serving it with baked tofu and some sort of green. In spite of the short ingredient list, the quinoa packs a nice flavor punch. The dish is a little salty, a little spicy, and pretty smoky. It’s also got a touch of umami, thanks to the tomatoes, which you can boost with some nutritional yeast or by adding mushrooms to the recipe. Garlic is another possible addition, and the spices can be varied to suit your taste. Heat the oil in a medium sized pot over medium heat. When the oil is shimmering, add the onion. Cook, stirring frequently, for 5 minutes, or until the onion is soft and clear. Add the quinoa, broth, tomato sauce and paste, paprika, chili powder, oregano, salt, and chickpeas to the pot. Bring to a boil. 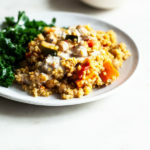 Reduce the heat to low, cover, and simmer for 13-15 minutes, or until the quinoa has absorbed all of the cooking liquid. Fluff the quinoa with a fork and allow it to sit, covered, for 5 minutes. Stir in vinegar and crushed red pepper flakes to taste, adjust seasonings as needed, and fold in some fresh herbs, if you like. Leftover quinoa will keep for up to four days in an airtight container in the fridge. It can be frozen for 4-6 weeks. OK, friends, it’s back to nutritional epidemiology for me. Excited to check in soon for the weekend roundup. Have a great rest of the week. Chickpeas are my favorite legume! No such thing as too many chickpea recipes 😀 Excited to try this! 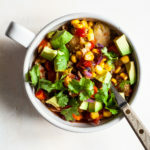 Love super simple recipes like this! I want to give this dish a try. Tomato flavor with chickpeas and quinoa sounds too good to pass on. I wish there were people I could make this for. It’s satisfying to share new healthy recipes with others. I’m curious about something. I don’t see broccoli listed in the recipe but there is broccoli in the pictures. Did you decide to have broccoli as a side when you were taking the photos? Yes, I served broccoli as a side in the pictures! Lots of other vegetables would be nice accompaniments. The recipe is indeed easy! I tried it yesterday and I really liked it. So delicious and simple to prepare. Love it!! Finally found something we all love as a family, thank you! Amazing recipe Gena. Quinoa is a very new thing here in Greece and we never tried it with tomato paste before. The addition of smoked paprika (one of our most cherished spices) must be taking this to a whole new level. Thanx so much for the delicious post! I have been wanting to make this for a few days now and I finally made it tonight! I loved this recipe and will definitely be making it again!! Love this! Love all your healthy recipes. Thank you for sharing. Made this last night. It was so good! My only change was I added mushrooms with the onions. Also toward the end, I mixed in some leftover broccoli I had baked the night before. Great easy dinner! Yum! Can’t wait to prepare this dish, Gena! Do you prepare a homemade tomato sauce? Not for this recipe, Agness, but you could definitely use a homemade sauce recipe if you like! What size pot did you use to cook this in? I know you said medium, but how many quarts? This recipe is DELICIOUS — and thank you for introducing me to smoked paprika! I will be adding this dish into our regular rotation. It’s the perfect combination of simple, clean and healthy – and adaptable for any meal! I am so glad you enjoy it, Nancy!